This tutorial explains how to pack a blood specimen for air travel. Following these steps will insure that your Whole Blood, Platelets, Human Organ or Tissue will satisfy the Airline Industry's Standards of Safe Handling of Hazardous or otherwise Perishable Materials. * Properly sized Styrofoam or Styrofoam-lined cardboard insulated shipping boxes. * Disposable Underpad, or other moisture absorbent material. * Plastic bag with gather tie (not an air tight zip-loc). * No more than 4.4 pounds (US) of Dry Ice, unless otherwise prearranged by the Airline. 1. Determine the amount of dry ice required, depending on the duration of the trip. The amount of Dry Ice used must keep the specimen's internal temperature between freezing and 50ºF to keep it viable. Using a vented container prevents bursting, as the Carbon Dioxide renders back into a gaseous state. 2. Size the container depending on the amount of dry ice needed and no larger than absolutely necessary. The moisture absorbent material will act as insulation both between the Specimen and the Dry Ice, as well as between the plastic bag and ambient air temperatures. Undesired condensation will allow the freezing temperatures to pass through the absorbent/insulating material. 3. Consult your Airline of choice for specifics, before attempting to transport any amount of dry ice. Airlines allow dry ice in carry on luggage, but only in small amounts not to exceed a total limit determined by the size of the passenger compartment and total number of occupants. Airlines also regulate the total amount of dry ice allowed in the cargo hold, since carbon dioxide displaces oxygen and could suffocate animals traveling in carriers or cages. 4. Pack your Specimen or (Human Organ). First be sure that the immediate container (test tube, blood bag, etc) is tightly sealed. Wrap it in a layer of absorbent/insulating material. Seal this inside of a plastic bag, as the first liquid barrier. WEARING GLOVES, place this bag inside of a larger plastic bag and surround it in Dry Ice. Remove as much air from the bag as you can, before closing it with a twist tie. Do not make this an air tight seal! Poke several holes through the box, to allow for the release of Carbon Dioxide. Line it with absorbent material, before placing the bags inside insulated shipping boxes. Secure the lid of the container so that it will remain closed during the journey, being careful not to block the vent holes. 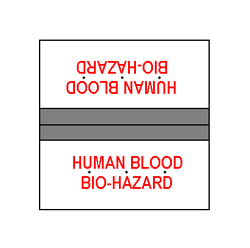 Properly Label the container with the words HUMAN BLOOD (or HUMAN ORGAN) and BIO-HAZARD in bold red. * Contact the Airline to let them know what you will be transporting and when, and ask what they will limit your total (individual) maximum weight of Dry Ice. The fewer the number of Passengers on the flight, the more dry ice they will allow. * Plan to refresh your dry ice, just before arriving at the Airport, and arrange for refrigeration upon arrival. * Dry Ice can instantly stick to bare skin and cause serious burns, handle with caution!